Voice responses from Alexa are now enhanced with visuals and optimized for visibility across the room. Call or message your family and friends that also have an Echo or the Alexa App, get the news with a video flash briefing, see your Prime Photos, shop with your voice, see lyrics with Amazon Music, browse and listen to Audible audiobooks, and more. All you have to do is ask. Echo Show has eight microphones and beamforming technology so it can hear you from across the room—even while music is playing. Echo Show is also an expertly tuned speaker that can fill any room with immersive audio powered by Dolby. When you want to use Echo Show, just say the wake word “Alexa” and Echo Show responds instantly. Make hands-free voice calls to almost anyone, or video calls to friends and family who have an Echo Spot, Echo Show, or the Alexa App. Use the Drop In feature when you want to connect instantly with other compatible Echo devices in your home. For example, you can drop in to ask what time dinner will be ready, see the baby’s nursery, or check in with a close relative. With Alexa Announcements you can also use Echo Show to broadcast a quick, one-way message to all other Echo devices in your home. Making calls with Alexa is easy. Set up your voice profile and teach Alexa to recognize your voice. When you say, “Alexa, call Mom”, Alexa will call your mom, even if you have multiple users in your home. When you’re busy making dinner, just ask Alexa to place a call from your Echo Show to almost anyone. 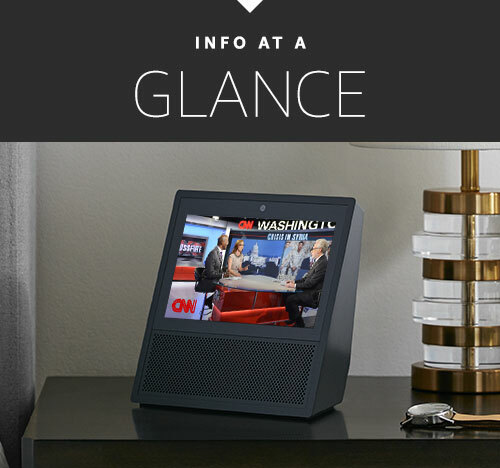 For news and information you can see and hear, just ask Alexa for your video flash briefing from CNN. Curious about the latest movie trailers or need a how-to video? Just ask. Powered by Dolby, Echo Show is fine-tuned to deliver crisp vocals with dynamic bass response and expansive sound. Watch as the display comes alive to show song lyrics, custom stations, curated playlists, and album art with Amazon Music. Listen to tens of millions of songs with Amazon Music Unlimited. Echo Show also connects to Spotify, Pandora, iHeartRadio, and TuneIn—giving you voice control for all of your music. Echo Show is Bluetooth-enabled so you can stream other popular music services like Apple Music from your phone or tablet. Equipped with eight microphones, beamforming technology, and noise cancellation, Echo Show hears you from any direction–even while music is playing. 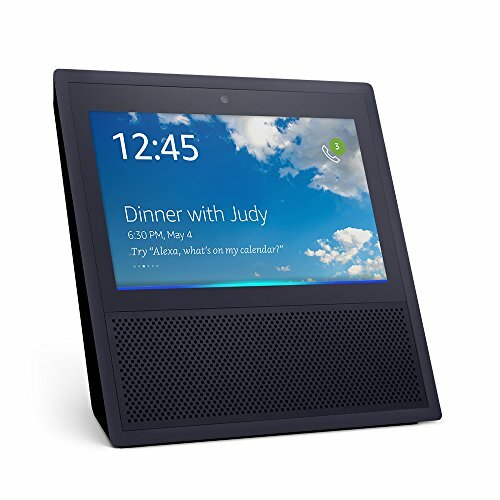 When you want to use Echo Show, simply say the wake word, “Alexa” and Echo Show lights up and streams audio to the cloud. The Alexa Voice Service is then leveraged to recognize and respond to your request instantly. 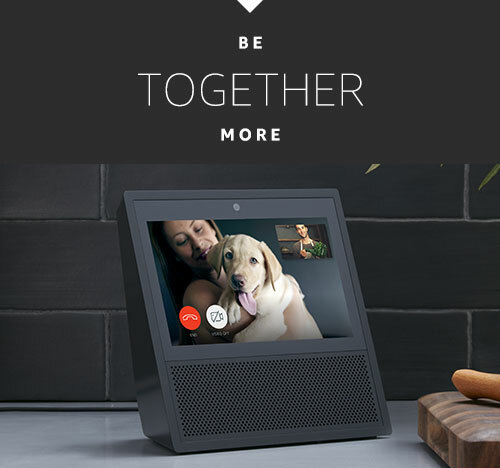 If you have more than one Echo Show, Echo, or Echo Dot, Alexa responds from the Echo you’re closest to. If you want to limit your interaction with Alexa, simply turn the mic/camera button off. Use Echo Show to see a live camera feed from the nursery or your front door. Turn on the fan or dim the lights from the couch—all without lifting a finger. Control multiple devices at scheduled times or with a single voice command, like locking the doors and turning off the lights when you go to bed (Coming soon). Echo Show works with smart home devices such as cameras, lights, fans, thermostats, garages, sprinklers, and more. Skills add even more capabilities like making a dinner reservation with OpenTable, requesting a ride from Uber, tracking your steps with Fitbit, trying a new recipe from Allrecipes, and more. New skills are being added all the time. You can also see ratings and reviews to learn what other customers are saying about skills in the Alexa App. 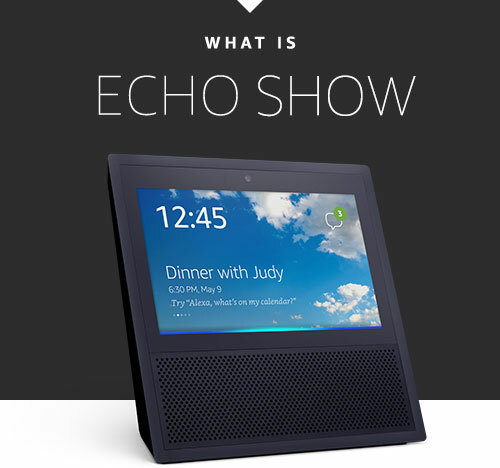 Echo Show brings you everything you love about Alexa, and now she can show you things. Watch video flash briefings, Amazon Video content, see music lyrics, security cameras, photos, weather forecasts, to-do and shopping lists, browse and listen to Audible audiobooks, and more. All hands-free-just ask.